WordPress has come a long way since its beginning, it was created as a blogging platform but is now way beyond that. You can easily make WordPress look like a website with just a few configuration and theme options. With the latest versions, especially version 3.0 where the custom menu feature was introduced you can use it for any kind of website. 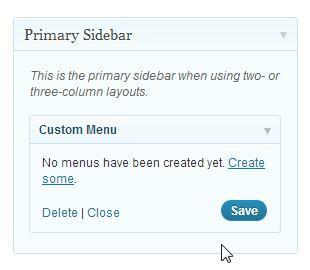 Using WordPress custom menu’s you can really create a good navigation for your website. If you have your WordPress website installed, it’s now time to have it look like a regular website. The first impression people will get when they visit your website is essential. They will either see a blog, or a website. 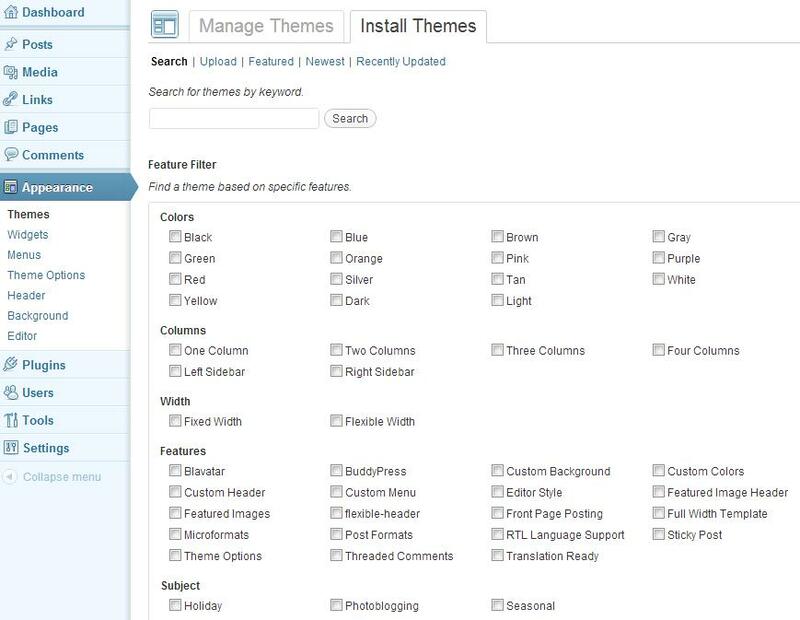 The way you make WordPress look like a website determined by the theme you choose and how you configured it. Do you use a standard theme or a theme that has a special homepage layout? Do you have a static homepage or do you show the most recent posts? 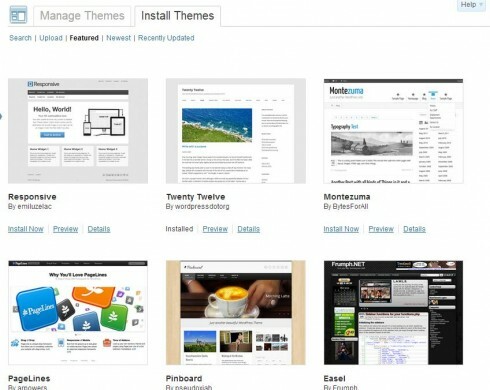 There are several options for choosing a special theme for your WordPress website. 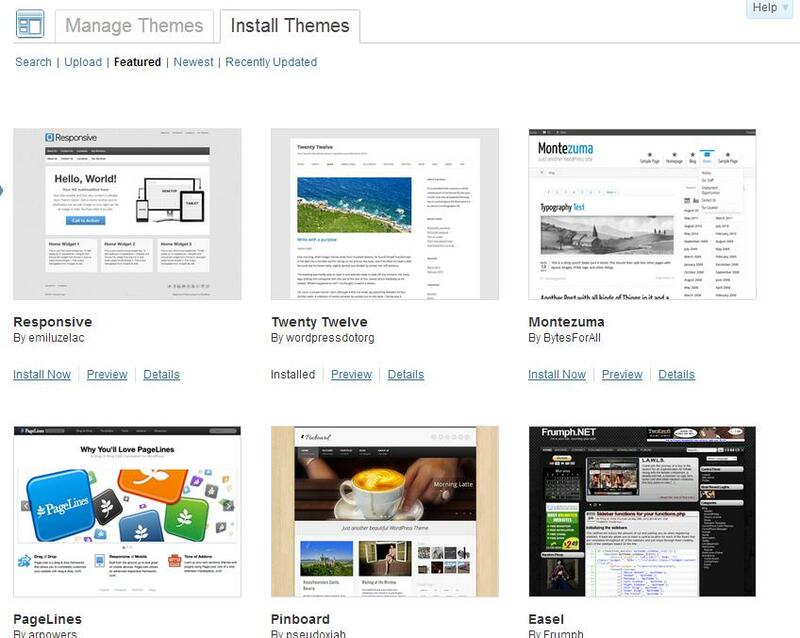 You can search the free WordPress theme repository right from within your own WordPress installation. Go to Appearance -> Themes. It opens with a search function that lets you select some search criteria. Upload your own, select one of the other options like Featured, Newest or Recently Updated. Or you can go for a, very affordable, premium theme from ThemeForest.net, ElegantThemes.com or my personal favorite, but more expensive, themes from StudioPress.com. Most of these themes will start with a featured image or an image slider on the frontpage, make sure you capture your visitors and keep them on your site. 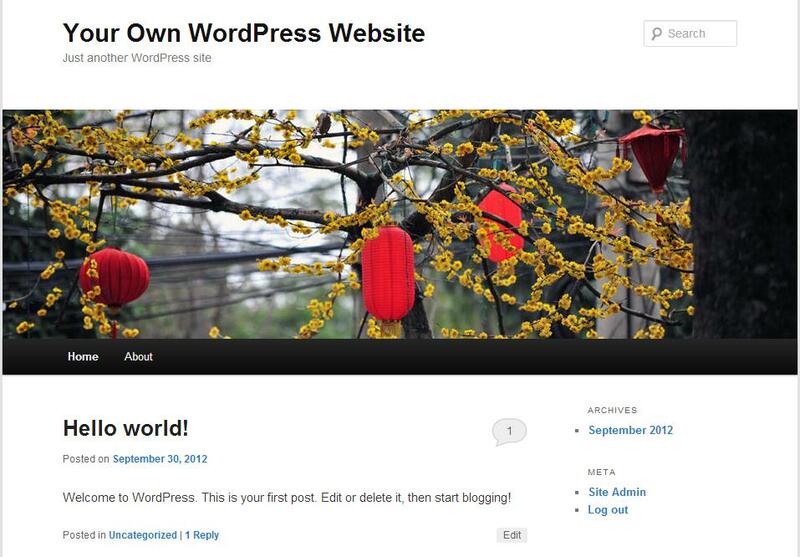 If you want to use a regular theme, you can still make you WordPress site look like a website. The first thing you need to do is to create a page that will become your homepage. Just one small warning, do NOT call this Home! If you call it Home it will create a permalink /home/ and that could become a problem. If you ever want to switch to a theme that does work with a special homepage layout. They will use a theme file called home.php and that might cause you real problems. And please, don’t call this page Welcome or start with Welcome to my website! That is such a waste of your homepage function. I might have searched the web and found your website, it might have been mentioned in an advertisement or was referred to my by a friend. So, unless you blocked your site for normal visitors, I know I am welcome. Just give your visitor really good information about you, your service or your interest, tell them what your website is all about. Lead them into your site and show them where your most valuable content is. Tell them what you want to tell them! And don’t forget to show some good images, a good picture can make a difference. Your website visitors are more attracted to images than text. If they scan your website to get a first impression an image can help to keep them on that page so they start reading. Your theme might show the option to get comments on that page, in that situation you need to un-check the comments and trackback functions. Look for these options. If you don’t see those options active the Discussion and Comments checkbox in the screen display options (upper-right corner of your edit screen, just above the Publish option). Once you created that page, you need to make a separate one that will be used to show your posts. You don’t need to use posts, but it is a good thing to have your setup ready in case you want to start writing posts. You can call this page anything you like. You can call it Blog or News or something that might add value to your website. Ramblings, Thoughts, Special Articles it doesn’t matter what you want to call it. Just name it so you can use it if you want to start using posts. Now here is the best thing about this page: Give it the Title you want and publish the page. Do not write anything on that page! Leave it blank. If you get those two pages done it’s time to configure WordPress so it will show your homepage and it knows where to show your posts (if any). In your Dashboard go to Settings -> Reading and chose Front page displays option A Static page. You can select the page you just created via a drop down menu when you click the left arrows. Save your settings and check your website, you should see the intro page you created as the Frontpage of your website. If you don’t see the new version, try to refresh your browser via Ctrl+F5. That will get the latest version of your site instead of the cached one that your browser might show. Once you get your site’s basic layout ready it’s now time to look at your sidebar. Your default sidebar is very likely to show things like Recent Posts, Archives, and Meta or it says Primary Widget Area. It all depends on the theme that is active on your site. Now Recent Posts, Recent Comments, Categories, Archives and Meta are a dead give away that this is a WordPress blog. You need to get rid of those widgets and replace theme with a good navigational menu. You can read How To Use WordPress Custom Menu’s and create a good menu that will show the basic navigation items for your website. Place that Custom menu in your primary sidebar via Appearance -> Widgets and drag the Custom Menu widget into your Primary Sidebar screen. You can see below that it will warn you if you don’t have a menu yet and guide you to get one done. If you have one, you can select it. The best part of these custom menus is that you can have several of them. I like to split my menu’s in two separate ones. The first one will contain the navigation into the meat of my sites and the second one contains informational links like the About page, a Sitemap, Contact page and a Privacy Statement page. Where I want to show these menus depends on the layout or the theme. You want your primary navigation menu in the most prominent place in your website. It should be the first thing your visitor can see if they want to browse through your website. The second menu should not be hidden away in some obscure place, but it should be less prominent. Once you placed this widget in your primary sidebar, the other widgets will disappear. Those widgets were there to act as placeholders to show you where your sidebar is located. There might be some widgets already in the sidebar, simply delete the ones you don’t want. Search might be one to leave active. Your theme choice will also determine if your primary sidebar is located on the left side of your screen or on the right side. For a blog, it is most likely to show the sidebar on the right side, if your theme has that option to switch it to the left, use that. It will also make your WordPress site look more like a normal website. If your theme does not support it via an option, your might need to change it in the index.php file or in its style sheet. How you can change that is a completely different subject, the best option to get to know how to change that is to ask in the support forum of your theme. For the website shown above I used the new default Twenty Twelve theme from WordPress with the plugins One Click Child Theme to make sure my customizations will stick after a Twenty Twelve theme upgrade. I also used a Custom Headers plugin because with this new theme, there is no custom header function for pages. So now it’s up to you to get the layout that makes your WordPress website look like a website instead of a blog. This is actually great post. But, please help me to make my sidebar be clickable. My default twenty twelve theme is awesome, but the sidebar header is so flat. I’m not so good in coding. Thanks a lot. I find it funny how many people still think WordPress is just for blogging! Personally I use Blogger for my blogs (because to be honest I find it ranks in the search engines a little easier) and then WordPress for my websites, I just love how easy it is! 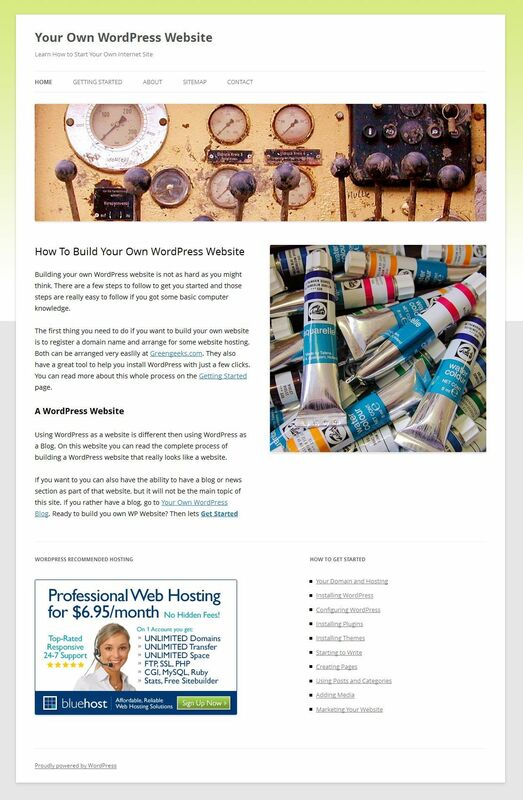 @Martie: I love blogging with WordPress and how you can easy create a special blog page in your website. For rankings I have better results with WordPress then with Blogger. I completely agree with you Herbert. I love wordpress platform for anything. It is a complete package. Whatever people say about wordpress it is very easy to understand for the people who are having less coding knowledge. Being an SEO analyst I think wordpress shows better results than any other platform. Working with a pre-existing theme, when I create the static page, it does what it should, however there is still a “Home” link on the navigation bar. How can I make that my static home page or remove that link so that my created page is the only true “home” landing page? @Case: Look to make a separate menu and replace that with the current one. If you have set the static homepage via Settings -> Reading your Home link should automatically be correct. It is however depended on the theme you use. 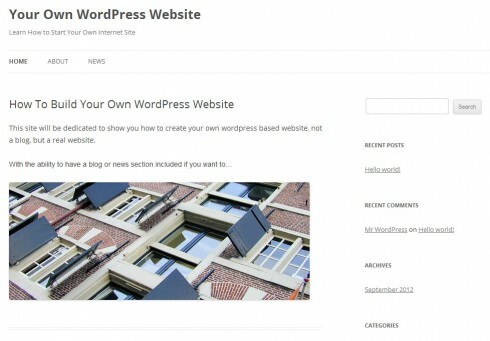 It the theme follows WordPress standards you should be good. The biggest problem is that people think wordpress is a blog, while you can make more than 12 kinds of websites with wordpress! I think its okay to create wp static site but security & keeping it up to date may be a problem. @john plz say how we can create 12 kinds of sites with wordpress. @Habib Manjotha: WordPress is getting better in keeping sites up-to-date with every new version. I do think having a plugin like https://wordpress.org/plugins/wp-updates-notifier/ and Wordfence https://wordpress.org/plugins/wordfence/ active will help to keep your WordPress install safe and up-to-date. For some sites it might be a good idea to use a blog posts page for news items to keep content fresh.